Could the LG V20 be the next mobile for your business? Samsung’s Note 7 has received terrible press for its recent recalls and likewise the new iPhone 7 hasn’t gone down well with its lack of headphone jack. 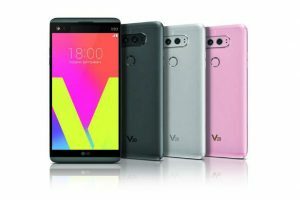 LG has recently released the new LG V20, with a replaceable battery, enhanced audio feature and manual camera controls for video.Â Is this the new smartphone to watch out for? By manually controlling the video camera, users of the LG V20 can record smoother, clearer videos when out and about. In addition, the Steady Record 2.0 analyses each frame to provide smoother playback of video recordings, meaning less noise and better sound quality. In fact, LG claims there is a 50 % reduction of ambient noise levels, great for those of you that require high quality video clips. Unlike the iPhone 7, the LG V20 offers not one, but two headphone jacks, one on each side of the charging port which allows the user to listen to audio through wired headphones or speakers. As is standard with all smartphones, the LG V20 has the ability to capture high quality photographs at the click of a button. The LG V20 however is that little bit different, as it offers two camera lenses.Â The first is an 8-megapixel 135-degree ultra-wide angle lens and the second, a 16-megapixel wide-angle shooter. This gives the user more flexibility when it comes to capturing that perfect shot. Â For those of you that love a selfieâ€¦ users of the LG V20 can fit more into their pictures using the front-facing 120 degree wide angle camera with 5 megapixels. The sleek, durable 5.7-inch Quad HD Display produces improved contrast ratio and colour reproduction using quantum technology for an enhanced image quality. The phone runs Android 7.0. Nougat which brings exciting new features including split-screen multi-window, streamlined notifications with direct reply and improved battery performance. There is a built-in fingerprint reader on the back of the phone which can also act as a power button or as a dual-camera setup. The V20 ships with a Qualcomm Snapdragon 820 processor, 4GB of memory and 64GB of storage which can be expanded up to 2TB through use of a microSD. The LG V20 is as competitively priced as some of the best phones currently on the market, including the Galaxy S7 Edge and iPhone 7. Although it has recently been released in the USA and Australia, there is, until now, no news as to when the LG V20 will be released in the UK.